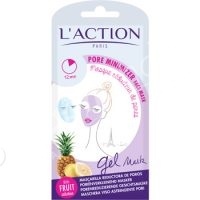 L'action Paris Pore Minimizer Face Mask is bursting with the natural goodness of Pineapple, Grape and Passion Fruit extracts. This exquisite mask tightens the pores, exfoliates and detoxifies your skin. The Pore Minimizer Mud Mask is bursting with the natural goodness of Pineapple, Grape and Passion Fruit extracts. This exquisite mask tightens the pores, exfoliates and detoxifies your skin. The perfect complement to the Pore Reducing Cream. The Pore Minimizer Face Mask tightens and reduces your pores. By unclogging and exfoliating your pores, your face is cleansed of impurities and your skin becomes smooth and mattified. Fruit Extracts: grape, passion fruit and pineapple (Pronalen Fruit Acids AHA-20) - stimulates cellular renewal, improves skin hydration and purifies the skin by eliminating excess sebum and dead cells. Grapefruit Extract - packed with vitamins that help repair and strengthen cells, this fruit also brings a tropical fragrance to the face mask. Apply the Pore Minimizer Face Mask to your face, leave for 10 to 15 minutes and rinse. Suitable for all skin types, ideal for greasy or problem skin.